GENEVA Iran's chief nuclear negotiator signaled progress at talks with six world powers Thursday on a deal to cap some of his country's atomic programs in exchange for limited relief from sanctions stifling Iran's economy, saying the six had accepted Tehran's proposals on how to proceed. U.S. officials said Secretary of State John Kerry will fly to Geneva on Friday to participate in the negotiations - a last-minute decision that suggests a deal could be imminent. "Secretary Kerry will travel to Geneva, Switzerland on Friday at the invitation of EU High Representative Ashton in an effort to help narrow differences in negotiations," a senior State Department official told CBS News. "What you see are incremental steps to not only build trust but to start to move toward the path of real concrete diplomatic deliverables," CBS News national security analyst Juan Zarate said of the negotiations. "On the U.S. and P5-plus-one side --the permanent members of the U.N. plus Germany that are negotiating with Iran--they want Iran to stop their nuclear program. They want in essence a freeze of any developments in the nuclear program, in part to be able to buy time and to build trust in the negotiations. The Iranians, on the other hand, want some degree of relief from the sanctions and at least a signal that that can happen. So the administration has been talking about putting on the table temporary sanctions relief that could be reversible if the Iranians don't adhere to their agreement." Even if an agreement is reached, it would only be the start of a long process to reduce Iran's potential nuclear threat, with no guarantee of ultimate success. Could Iran nuclear negotiations result in lifting sanctions? Still, a limited accord would mark a breakthrough after nearly a decade of mostly inconclusive talks focused on limiting, if not eliminating, Iranian atomic programs that could be turned from producing energy into making weapons. Tehran's chief nuclear negotiator, Abbas Araghchi, told Iranian state TV that the six - the United States, Russia, China, Britain, France and Germany - "clearly said that they accept the proposed framework by Iran." He later told CNN that he thinks negotiators at the table are now "ready to start drafting" an accord that outlines specific steps to be taken. Though Araghchi described the negotiations as "very difficult," he told Iranian state TV that he expected agreement on details by Friday, the last scheduled round of the current talks. The upbeat comments suggested that negotiators in Geneva were moving from broad discussions over a nuclear deal to details meant to limit Tehran's ability to make atomic weapons. In return, Iran would start getting relief from sanctions that have hit its economy hard. U.S. officials said Kerry will travel to the Geneva talks after a brief stop in Israel, where he will hold a third meeting with Israeli Prime Minister Benjamin Netanyahu, who has spoken out against any limited deal that would allow the Iranians sanctions relief. In Geneva, Kerry is expected to meet Friday with the European Union's top diplomat, Catherine Ashton, and Iranian Foreign Minister Mohammad Javad Zarif, the officials said. They spoke on condition of anonymity because they were not authorized to comment on the schedule. The talks are primarily focused on the size and output of Iran's enrichment program, which can create both reactor fuel and weapons-grade material suitable for a nuclear bomb. Iran insists it is pursuing only nuclear energy, medical treatments and research, but the United States and its allies fear that Iran could turn this material into the fissile core of nuclear warheads. President Barack Obama, in an interview with NBC on Thursday, described any sanctions relief as "modest" but said core sanctions against Iran would remain in place. "Our job is not to trust the Iranians," Obama said. "Our job is to put in place mechanisms where we can verify what they're doing and not doing when it comes to their nuclear program." International negotiators representing the six powers declined to comment on Araghchi's statement. Bur White House spokesman Jay Carney elaborated on what the U.S. calls a "first step" of a strategy meant to ultimately contain Iran's ability to use its nuclear program to make weapons. An initial agreement would "address Iran's most advanced nuclear activities; increase transparency so Iran will not be able to use the cover of talks to advance its program; and create time and space as we negotiate a comprehensive agreement," Carney told reporters in Washington. The six would consider "limited, targeted and reversible relief that does not affect our core sanctions," he said, alluding to penalties crippling Tehran's oil exports. If Iran reneges, said Carney, "the temporary, modest relief would be terminated, and we would be in a position to ratchet up the pressure even further by adding new sanctions." He described any temporary, initial relief of sanctions as likely "more financial rather than technical." Diplomats have previously said initial sanction rollbacks could free Iranian funds in overseas accounts and allow trade in gold and petrochemicals. Warily watching from the sidelines, Israel warned against a partial agreement that foresees lifting sanctions now instead of waiting for a rigorous final accord that eliminates any possibility of Iran making nuclear weapons. At a meeting with U.S. legislators in Jerusalem, Netanyahu spoke of "the deal of the century for Iran." While divulging no details, he said the proposed first step at Geneva "will relieve all the (sanctions) pressure inside Iran." The last round of talks three weeks ago reached agreement on a framework of possible discussion points, and the two sides kicked off Thursday's round focused on getting to that first step. Thursday's meeting ended about an hour after it began, followed by bilateral meetings, including one between the U.S and Iranian delegations. EU spokesman Michael Mann said the talks were "making progress." 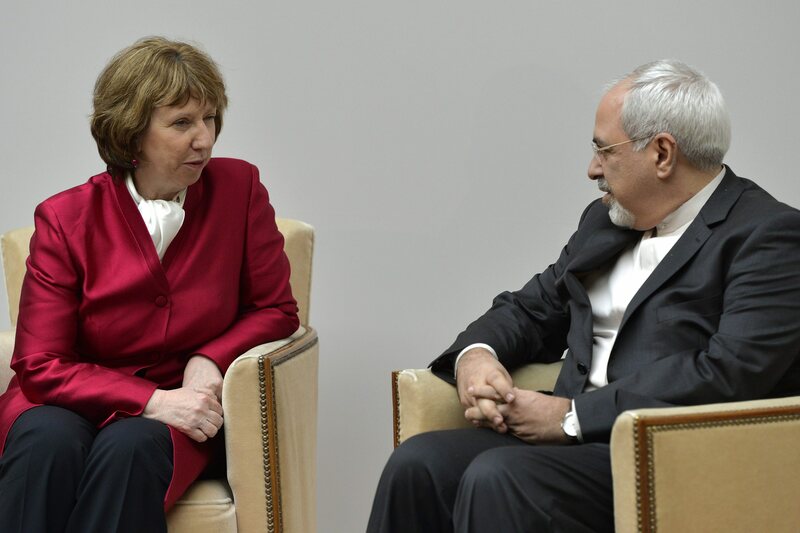 Before the morning round, Zarif, the Iranian foreign minister, met with the EU's Ashton, who is convening the meeting. Asked afterward about the chances of agreement on initial steps this week, Zarif told reporters: "If everyone tries their best, we may have one." After nearly a decade of deadlock, Iran seems more amenable to making concessions to the six countries. Iran's new president, Hassan Rouhani, has indicated he could cut back on the nuclear program in exchange for an easing of sanctions. Despite the seemingly calmer political backdrop, issues remain. Iranian hardliners want a meaningful - and quick - reduction of the sanctions in exchange for any concessions, while some U.S. lawmakers want significant rollbacks in Iran's nuclear activities in exchange for any loosening of actions.